In the excavating business, locating utilities before a job is a crucial step to take. Today we explain that while it is important to “call before you dig,” there’s more to it than simply making a phone call. Obviously, we need to know what utilities and lines are underground or overhead before we start digging. Sometimes we may even need this done before we can give an accurate estimate because the route we take can be affected by what’s in the path of digging. Electric…gas…water…sewer…high voltage…cable…phone…irrigation…traffic lights…fiber optic…these provide service to a house, a neighborhood, a shopping center. It can be very costly and inconvenient if a line is damaged or cut. Hitting a fiber optic line could put a company out of business. Hitting a high pressure gas line could cost a worker their life. Having as much information as possible before we excavate is a must. 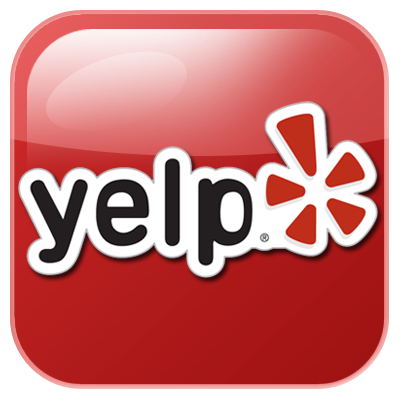 It is important to know that Joe Frei Excavating will call for the locates of a project. Not only do we relay specific information about where locates are needed, but the liability is then on us as a contractor. Beware of a company or person who asks the homeowner to request locates – they may be working “under the radar”. If you have an emergency, we will call it in as such and the locates will be done in a short window of time, maybe 1-2 hours. We will be on site to meet the locators in this situation. For all other situations, we must allow 3 days for the agencies to locate their services. For the most part, locates are free but in some instances, we may hire a private locator if we think additional work is warranted. If you are planning on digging in your yard to plant a tree or install a sprinkler line, you should call 811 yourself, allowing 2 days after the day you call to dig. Joe has a lot to watch out for while installing a new water main behind this shopping center. In addition to high voltage electric and gas lines in the alley, each business has its own utilities coming out the back. 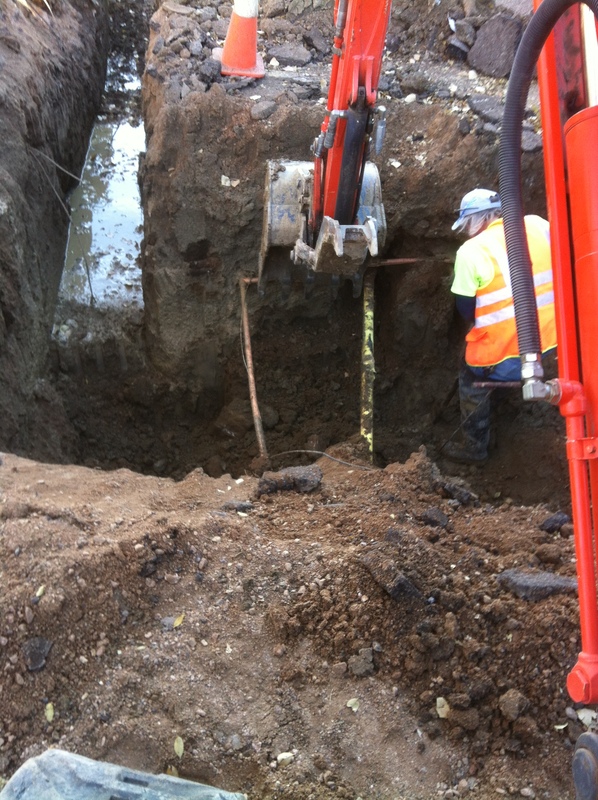 On this project we are using high-pressure water and a hydrovac to expose the utilities. 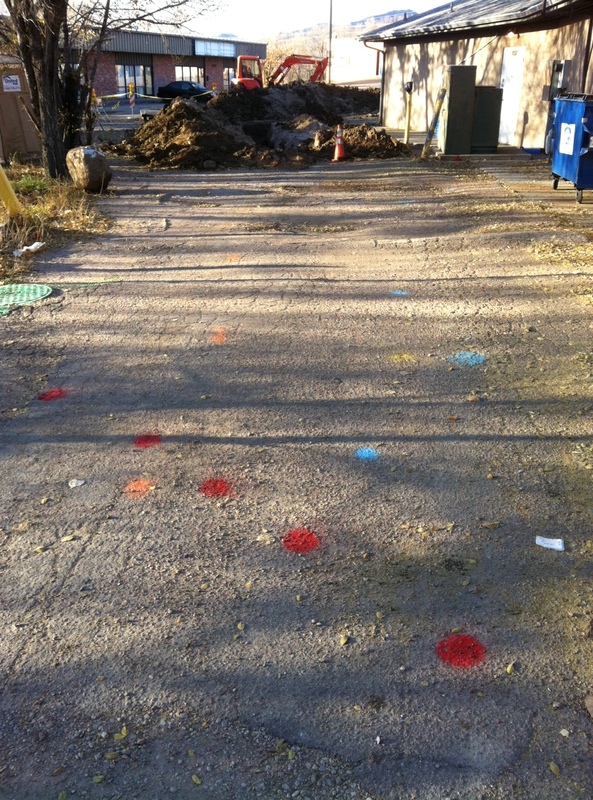 Once we start excavating, we are careful not to hit any marked lines. Sometimes we may be gingerly digging next to, or even under, a service. Joe can often “feel” something unusual, even using the excavator. He often hand-digs around a line if he thinks it is necessary. Locators are allowed 18″ of leeway to either side of a located line. A representative of Stratmoor Hills Water & Sanitation watches as Joe cautiously digs between a copper water line and a plastic gas line. After all of this prep work, the locates are not 100% accurate. Sometimes there may be old, abandoned lines that are not in an agency’s records. It’s helpful for us to talk to folks that are familiar with the property and gather as much information as possible. When we install a new service or water line, we run tracer wire along with the pipe in the ditch before we backfill. By doing so, future locates on these lines will be more accurate and easily found. And that is why location is important! This entry was posted in Uncategorized and tagged Joe Frei Excavating. Bookmark the permalink.